Is it really already the middle of November!?!? This year has flown by. I feel like I'm decorating for a new holiday or season every other week! Anyone with me!? So, our first post is showcasing our Thanksgiving and Fall inspired mantle. Our lovely mantle has a beautiful little story of it's own. In May of 2009, Southern Illinois was hit with a HUGE storm. They actually classified it as an Inland Hurricane! During the storm, an old piece of wood from a local saw mill washed up in our creek behind the house. We didn't think anything of it. It was among many of other things that washed up. Then last year, I came home from work one night and found it drying out in our garage!!! Charlie had a BRILLIANT idea to make this wash-up a mantle! It's become my favorite part of our living room and definitely the focal point. 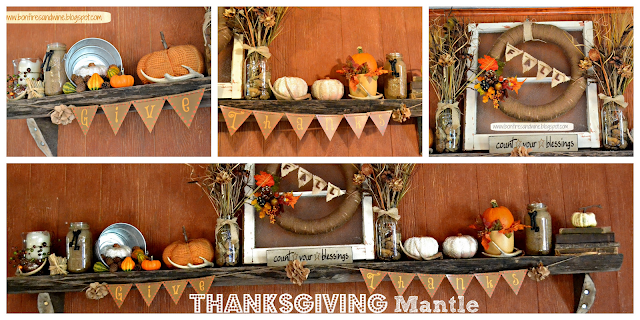 So, here is our Thanksgiving and Fall inspired mantle! There are so many beautiful mantles and fall projects on Pinterest and they provided a lot of inspiration for all the pieces on ours. One thing about our mantle is that we are NOT lacking space. It's obviously quite long, which is what I love about it. We started with a simple white candle in a large vase with berry garland wrapped around it. A few large mason jars filled with sand wrapped with jute ribbon and an antique key. Of course a lot of pumpkins! Some dried naturals in mason jars. And an old window with our DIY wreath on the front. 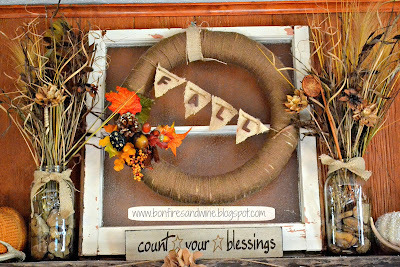 The wreath inspiration came from my friend Tonya, at Love of Family and Home. You can check out her tutorial HERE. I also knew I wanted to add some sort of bunting on the bottom, but couldn't find a printable online that I fell in love with and that matched our colors. So, what else is a girl to do but make her own? And, what kind of person would I be if I didn't share!? Here ya go! Print away! We'll also come back later this week for a quick tutorial on those pom pom flowers you see on the bunting! Here's our window display up close. So there it is! What do you think??? We are quite happy with it. I am not happy that I've had this up for what seems like 3 minutes and it's almost time to re-do it for Christmas!!! Where is the time going!?!? That's it for today. Check back soon and we'll show you which space in our house just got stripes! Your mantel looks beautiful Emily!!! What a great idea Charlie had to use that old piece of wood leftover from the storm to create such a fun & unique mantel! You did a fabulous job decorating it! Congrats on your 1st blog post!! I shared this on my Google + page, on twitter, & pinned it for you!! Way to go girl!! Welcome to blogging! It sure looks pretty :) Love the wreath and chippy window. Yum! Visiting via Tonya. Looks great Emily!!!! Congrats on your new blog. I can't wait to see more! I'm sure you are going to have alot of great ideas to share with everyone and its so nice that you have that handy husband to help you!